Oh Rosalind, I was sat here in a midst of homework and to do lists when I spotted your new post and I have to say it has calmed me so much and made me think of my own summer swimming in the waves and eating fish and chips on the beach as the sun sets. It is these memories which will last forever - the simple pleasures of a summer holiday. I have to say I can sympathise with your weaver fish sting - it happened to me last summer and I hobbled up to the lifeguard hut to be greeted by a bedraggled group of similarly pained bathers all with their stung feet soaking in blisteringly hot water to try and draw the sting out. Not pretty! So glad you are enjoying sixth form - my year is going really well and I can't believe it's November already! Much as I love school life though I really wish I had more time to dedicate to my blog - I posted for the first time in a month this week and it just felt so good to right something which wasn't an essay or practise exam paper! That dress is such a heavenly, mermaid hue. The beach is beautiful as are the vivid pictures that story brings to mind. Absolutely stunning Photography and post. Sounds absolutely lovely, all of it. Brings back memories of Oregon. Another good blackberry poem is "Blackberry Picking" by Seamus Heaney. He's a lovely contemporary poet. Beautiful photos, they remind me of the story of Ondine. The colour of the dress is incredibly beautiful! You look great! This place sounds perfectly full of memories. Whenever I go to France now where my mum is living at present but where I used to go for school holidays for 15 years, I return to the past. Some things have remained the same over the years but others have changed in a way that makes me wish I was 8 again, building tree houses in the woods for hours on end with friends who have long since left that part of the world.. Anyway, your green dress is really lovely, it stands out so well against the rocks. Beautiful and I love the Sylvia Plath at the end! Wondeful photos, my dear Rosalind. I love to know that they are un-edited. 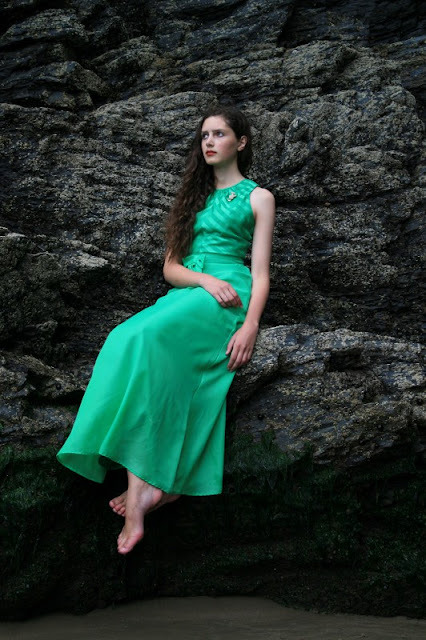 The photographs are so pretty..., the dress is the more beautiful green dress I have ever seen!!! Congratulations to your wardrobe. This is the perfect setting for that dress! You look so pretty and otherworldly. You are very ethereal, especially in such a setting as this! You go to such beautiful places. You have captured that wariness of childhood memories, and yet the inexplicable draw that those places we spent our young time in have over us so perfectly. Both your mother and yourself are incredibly talented. The photos are stunning and your writing is really beautiful. So sorry to hear about your encounter with the spiny fish. I dread the day when I might have such an experience. Beautiful, just beautiful! The colour of that outfit is so striking against the dark background of rocks. And your hair! I don't think I've seen it that curly before. Amazing dress I love the green, and the rocks. Also loved the stuff about the beach when you were younger, relay made me thing of when I was little and going to the beach. The weaver fish sounds dreadful. Almost the only things in the Caribbean Sea that we had to watch for were sea urchins and fire coral. Ok, barracudas and sharks, but honestly, they were never a danger. It's those who have short summers who appreciate it the most, for what's fleeting is most precious. The green of your dress and the moss against cool grey stones...breathtaking! oh my God, you are so beautiful !! I just discovered your blog and I am fascinated by your style !!!! I hope you projects will be done !!! Beautiful, thank you for these stunning pictures ! Simply breathtaking. Perfectly styled for the ah-mazing location you choose. The dress is stunning on you, beautifully written post as well. Gorgeous dress and wonderful memories...old and new. Lovely dress, such a great colour! And pretty photos. Sounds like a nice trip. Meravigliosa, That's Art . . . Cheers! Che Poesia, che Fascino, che Arte . . . Molti complimenti per il tuo Talento ! oh! I am swooning at these photos. They are wonderful. There is a recurring word for your photos....HAUNTING. For are haunting in the most beautiful and mesmerising way! I'll wear tiger pants, I'll have an affair. We'll meet in another life, we'll meet in air. Me and you. I might have it befuddled. It's been too, too long since I've read some poetry. Thanks for the inspiration as usual. Love this post! Looks stunning in these green <a href="http://www.loudstarbazaar.com/shop/brand-mon-peche-mignon/mon-peche-mignon-sheer-lace-dress/p_8.html>Feminine dresses</a>. These pictures are stunning. I would love to visit this place :) And that green dress was perfect for the scenery, I love it! I totally know what you mean about relaxing on a beach reading a book, seems so long ago! I thought I've never liked short stories, but I changed my mind since discovering your blog as every post is like reading a new chapter of a book full of different tales. Love the third image: your silhouette and pose are so elegant. I can completely sympathise with the arduous task of learning Latin vocab,I have quite a few sheets sat next to me which I really should be attempting to learn! Out of interest what have you taken at a-level? I'm considering which subjects I want to study next year, but I'm far too indecisive for my own good! As always your photos are beautiful, the contrast between the stark background and the green of the dress is breathtaking. Your writing never fails to captivate me.